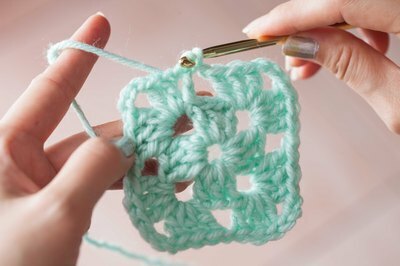 If you are just learning to crochet, the granny square pattern can be a good place to start. 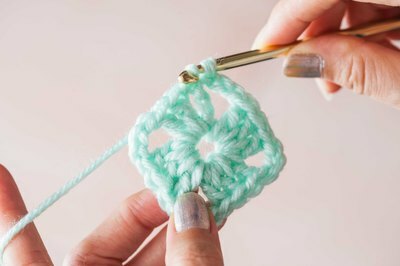 The crocheted granny square is worked from the center out to the edges, so you can make a granny square as small or as large as you like just by altering the number of times you repeat the pattern stitches. Make a granny square baby blanket for beginner's using only one skein of yarn; this way you won't have to worry about weaving in extra ends or changing colors halfway through the project. 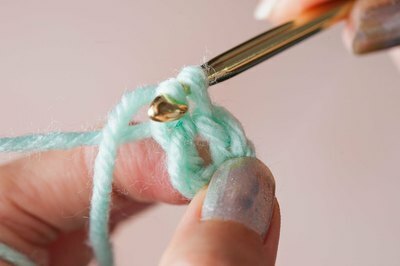 Attach your yarn to your crochet hook by making a slip knot, leaving a tail that is approximately 4 inches long. Make five chain stitches to start the blanket. Join the first chain stitch to the last chain stitch to make a circle. To do this, make a slip stitch through the first chain; this will join it together with the chain loop still on your hook. Work the first round of your granny square. 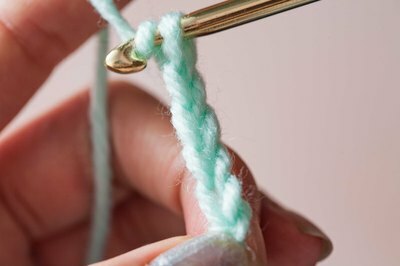 Make three chain stitches, then make two double crochet stitches into the center of the circle you made in step two; the first three chains count as a double crochet and this group of three double crochet stitches is called a shell stitch. Make three chain stitches and another shell stitch; repeat this so that you have a total of four shell stitch groups, then finish with three more chain stitches. Make a slip stitch into the top of the first three chains you made in this round. 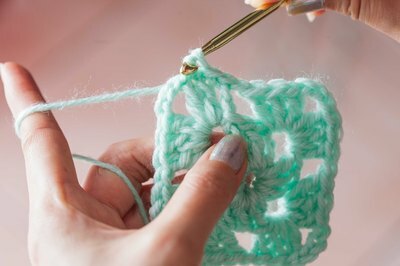 Crochet the second round of your granny square. 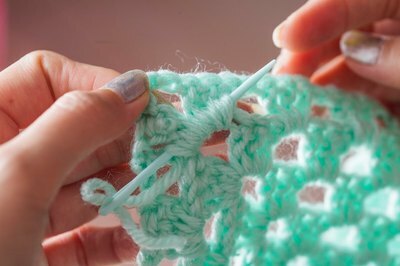 Make a slip stitch in the top of each of the next two double crochet stitches and in the space made by the three chain stitches from the previous round. In that space, work the following stitches: chain three, two double crochet stitches, chain three, shell. Chain one and work the following stitches in the next chain three space: shell, chain three, shell. Repeat this pattern around in every chain three space; end by making one chain stitch and joining the round with a slip stitch as you did in step three. Work the next round of the granny square. To do this, slip stitch in the first two double crochets and in the chain three space from the previous round. In this space, work the following stitches: chain three, two double crochets, chain three, shell. As you work down the side, each time you come to a chain one space from the previous round, you will work the following stitches in that space: chain one, shell. When you come to a corner (a chain three space), work these stitches: shell, chain three, shell. Continue around and join with a slip stitch. Continue to repeat step five around your granny square. With each subsequent round, you will have four corners but more chain one spaces along the sides. Stop when you run out of yarn or your granny square baby blanket is large enough for your liking. Cut your working yarn and weave in all of your loose ends with a large eye blunt needle. If one skein of yarn is not long enough for your blanket, add a second skein to make a larger blanket. Change the color of your yarn every round after you get comfortable with this technique.